The route for the 2008 Paris-Nice was unveiled today. 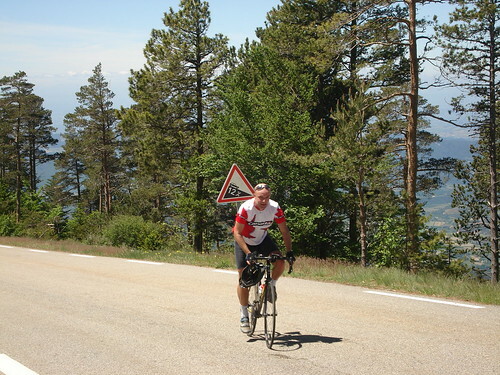 Stage 4 will climb Mont Ventoux on the lessor known Malaucene side - but will only go as far as Mont Serein Ski Station. Stage 4 will climb Ventoux on the Malaucene side – but will only go as far as Mont Serein Ski Station. In the elevation profile above, you can see Mont Serein about two thirds of the way up. For those not familiar with this side of Ventoux, the Malaucene side is almost the exact same length and difficulty as the more legendary Bedoin side. Here are a few stats. In other words the finish will be almost 500 metres vertical below the summit of Ventoux. The climb will be rated 1st categorie. Whereas, Ventoux is of course usually Hors Categorie. The course will pass through Bedoin, and climb the 3rd Categorie Col de la Madeleine (not the famous Madeleine) on the way to Malaucene. In fact, if you are climbing in the summer, this extension makes the perfect loop (climb one side, descend the other, link back via Madeleine). The map below shows the complete climb from Malaucene – you can see Mont Serein. I cycled this side in May 2007. See here for more. There are long very steep stretches – despite not finishing at the top, this will still be exciting. All I can say is… I live vicariously. Keep these posts coming. Thanks again! yes, no doubt because of the snow. thanks for the news & link ! hopefuly I can bring back some good pictures. Col de la Croix de Chaubouret looks the biggest climb on stage three. 1re Categorie. Do you know it? Yes, St Chamond – Croix de Chaubouret is a famous local climb; I have tagged my photos taken on that way (http://www.flickr.com/photos/pf8468/tags/pn2008/); on that side, some parts of the climb are difficult because there are no hairpins ;-), the road is steep and straight; that is where I plan to go & see them; there’s nothing like seeing the pro riding on a road you know well…makes you really measure how fast they are ! In Japan the cycling is hilly all the time. In 5 years 2003 to 2008, 40,000 km and 600,000 vertical meters. 168,000 vm was the most in one year (2003) between 2003 and 2008, at age 47-52. 20 yrs and 160,000 km and 2.5 million vm.